This new hotel in St. Louis Park MN is just minutes from downtown Minneapolis and the Minneapolis Convention Center - Target Center - Guthrie Theater and new Twins Stadium. 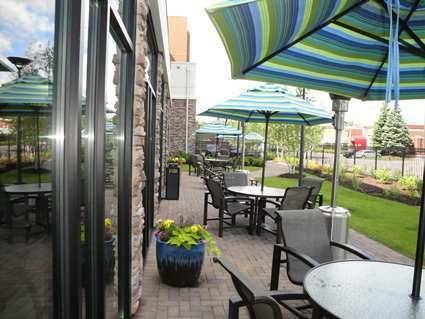 Connected via a walking path to the West End Lifestyle Center - the new Homewood Suites is surrounded by upscale restaurants - shopping and entertainment options. Conveniently located at the intersection of Highway 100 and 394 - Homewood Suites is close to many local business offices - including Honeywell - Allianz - Syngenta - Tennant - United Health Care and General Mills. With complimentary high-speed Internet and complimentary parking - the Homewood Suites offers a great value for travelers visiting the local area or downtown Minneapolis. Maintain your fitness routine while on the road with our expansive on site fitness center and indoor pool and whirlpool. Enjoy a healthy and hearty start to the day with our complimentary hot breakfast buffet. Get your work done with our comfortable work space in your suite or in our 24 hour business center. A fully equipped kitchen in each suite means you have everything you need to make your favorite meals or just heat up leftovers from one of the area*s many great restaurants. Relax at the end of a productive day with our Manager*s Reception - Monday through Thursday evenings featuring complimentary beverages and a light meal. All reservations must be guaranteed with a major credit card or advance cash deposit to hotel regardless of time of arrival. All reservations must be cancelled by 24 hours prior to host time unless deposit is required. Policy subject to change. All reservations must be cancelled 24 hours prior to host time unless deposit is required. If this reservation has been made electronically please cancel it electronically to avoid confusion and a no show bill. Policy subject to change. Fresh vibrant American cuisine with a touch of Asian influence. Menu includes pastas salads and sushi. Great bar too. Irish pub conveniently located within walking distance. American cuisine with French influence. Enjoy breakfast all day or simply have a cup of coffee in our gourmet coffee shop. Other menu items include sandwiches salads pastas. Consistently good. Local gourmet coffee shop with pastries oatmeal and light lunch premade options. Start your day with a mocha or a latte. Rediscover the personalized experience of having your choice of succulent seafood tender chicken juicy steaks and garden-fresh vegetables grilled to delicious perfection in an extraordinary theater that will feed the senses and entertain the appetite. Subterranean man-carved passageways, sometimes used as a mushroom farm, sometimes used as a speakeasy, are open for tours. See the gangland murder bullet holes! ~13 miles from Saint Louis Park. ~18 miles from Saint Louis Park. ~38 miles from Saint Louis Park. ~78 miles from Saint Louis Park.